Now that fall is here, it’s time to focus on some of the cool-season vegetables available at the local farmers markets. 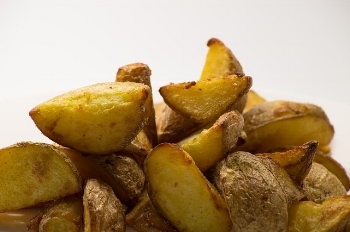 Palatable potatoes are right at our fingertips so, pick some up for meal planning today. Potato (solanum tuberosum) is part of the solanaceae or nightshade family. The family includes eggplant, hot peppers and tomatoes. Potatoes are a tuber that forms off of the plant stem and grows in the ground. Potatoes USA reports that, in the U.S., there over 200 varieties of potatoes that fit into the following seven categories: russet, red, white, yellow, blue/purple, fingerling and petite. Did you notice that the sweet potato was not included in the potato types or categories? That's because the sweet potato (Ipomoea batatas) is not part of the potato family. It is part of the convolvulaceae family that includes the morning glory. Even though they are related, sweet potatoes are often misidentified as yams. They are not a yam. They are the edible starch storage roots of the sweet potato vine. Throughout history, the white fleshed potato has fallen prey to many repeated food myths. These myths incorrectly conclude that white fleshed potatoes should be completely avoided and that they are bad for you. The white potato doesn’t deserve such a bad rap and, in a few minutes you’ll see why. Both Solanum tuberosum and Ipomoea batatas offer many great health benefits, such as being naturally fat and cholesterol free. To show some of what they both have to offer, here’s 12 nutritional comparisons of the white and sweet potatoes. Comparison includes eating the skin of the white potato and the sweet potato without eating the skin. The serving sizes for the comparison are bigger servings, which may be used as a main part of the meal. On a weekend morning, in my home, both red and sweet potatoes are the foundation for a scrumptious skillet breakfast. Here’s a quick review, not a well written recipe, for how we make them at our house. Preheat oven to 400 or 425. Cube enough red and sweet potatoes for however many people you’re serving, make sure to leave the skins on both types and to cut them to relatively the same size. Microwave the potatoes, covered, on high power for about 5 minutes or until slightly soft. Remove from microwave and, place them in a roasting pan. Sprinkle them with enough olive oil to lightly cover and shake them around. Season to your taste with whatever you like. This is where I just be creative and do whatever. Place in the oven for about 15 – 25 minutes, depending how crunchy you like them. Turn about every 5 minutes to allow them to get crunchy on all sides. While they are roasting in the oven we sauté whatever vegetables we want to add and make our eggs. When the potatoes are ready, we plate them, sprinkle them with our favorite cheese, add the veggies and top it with our eggs. Yummo!!! FYI, they reheat really well for breakfast burritos or side dishes. Thanks for reading and enjoy trying out some of the recipes below.